GSPP MPA Project Presentations took place on 11 November 2018. This is the last step towards graduation. 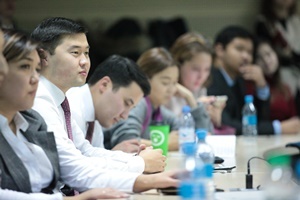 Students’ presentations topics ranged from: Public Service Motivation in Kazakhstan; Government-media relations in crisis communication in Kazakhstan; Privatization in Kazakhstan; to Comparative advantage of Kazakhstan in Aerospace, and Burden of disease attributable to ambient air pollution in Kazakhstan. This was an exciting opportunity for students to see how this process works at the GSPP, support their peers, learn from feedback and develop ideas for their own research.